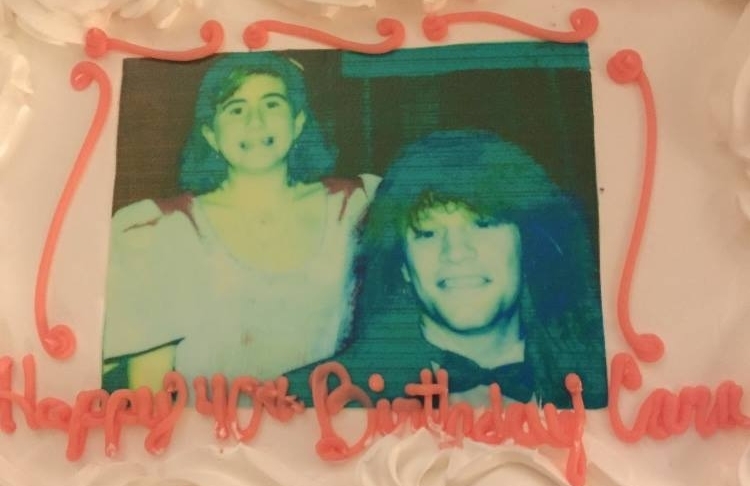 On January 5, while dealing with our chaotic daily routine, receiving loving well-wishes from near and far, opening cards that contained jokes about how old I was and eating a cake that had the legendary picture of me at my most insanely awkward teenage stage meeting Bon Jovi emblazoned across it's surface, I turned 40. I felt...the same. But the day, as it does, just due to that number screaming its cultural significance in your face (FOUR-OH) at every juncture, felt weighty. And it wasn't due only to the amount of cake I ate. Have I talked about my situation with birthday cake on this site? About how much I love it, and love icing especially, and how I can't be around birthday cake it unless I'm eating it or planning the next time I'm going to eat some of it? Probably. I think about it all the time. In my semi-limited experience so far, being 40 includes some negatives, like having to schedule a mammogram - which, wait, don't get mad, I realize is important and life-saving, but is not something I am exactly looking forward to - and filling in my age on the forms one has to fill out on various occasions (like when I get my mammogram, that'll be one of them) and now having to put "40," and then having a small but somewhat crippling episode where I think about my life's accomplishments and if they're good enough and what if I'm never good enough?? There are positives, too, of course, like the increasing comfort I've accrued in recent years about - well - everything. My likes, and dislikes and decisions about how I spend my time. My hair and my height. Certain declarations, like the one I made as I sipped coffee in bed with J before the rush this morning that I am not going to get up before 6 am and exercise in February, I'm just not going to do that, or feel bad about not doing that. I'm 40 now. It's trite and common but true: because of my age, and simply because of life, I care about different things than I used to, and I'm happy to report that caring about those things more feels better. I care more about quality time with my children and less about securing quality time with myself; this isn't because I'm a better person but because I've arrived, through the basic algorithms of time, at a less labor-intensive stage of parenthood, and my kids, now a little older, are more capable of hanging out in a real way. Even Aidy, at only three, is a delightful companion, which might be a result of the fact that, as our third and most effusively social child - stating, every single night, that she'd prefer "a friend" to sleep with - the brand of parenting she receives is far less stringent. We watched "Say Yes to the Dress" the other night well past her bedtime, all snuggled in bed and I didn't for a moment worry about how I'd eventually get her out of there. I care more about doing the right thing, both because you should do the right thing and because I want to be a good role model for my children. I've started blathering on about important issues in an admittedly annoying fashion at times (usually in the car where the kids can't escape) which Nora calls me out on consistently: "We KNOW WE ARE SUPPOSED TO BE KIND IT'S THE MOST IMPORTANT THING STOP TALKING." She can spot my good-willed tirades from a mile away at this point. Like when I perk up while listening to a public radio story and then turn it down and announce, "Hey guys! Do you know what 'civil rights' are?" and she starts groaning because, once again, I've interrupted something super fun they were talking about to deliver an impromptu ethics lesson. I am not, not even in the slightest, trying to point out how wonderful I am now that I'm 40. Only that all the things I care about are much closer to the surface. I won't shut up about them. This probably a typical tendency for all of us as we get older, and is probably why children get so embarrassed by their parents. There are the less overt moments that mark this age, too. Last night I put on a facial mask - the kind where the treatment adheres to an actual mask, with eye and mouth holes - and turned on the television. The children were asleep and J was playing guitar downstairs, and I was blissfully alone, practically brain dead from a few insanely busy days, and excited to channel surf, which, in this age of binging shows on Apple TV, we just don't do anymore. I stumbled unto an MTV show called, "Siesta Key," the network's latest iteration of reality programming, featuring sun-kissed young people trying to figure out what to wear to a costume party and also if Garrett really did his girlfriend wrong, or something like that. I watched - aghast at their youth, at the vapidity of this show - looking like the villain from every horror movie with that mask on. I had tea on the beside table, and the house was full and calm and warm. I relaxed on the pillows, feeling so acutely the distance covered since I was that young. And the possibility simmering in all the years ahead.